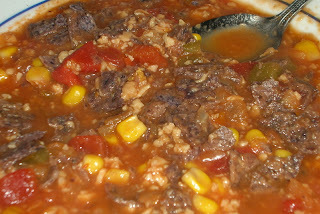 Taco soup: TVP (texturized vegetable protein — sounds yummy, yes?) provides some power-packed chunks instead of ground meat or chicken breast. I dig the blue corn chips because they hold up better in the "soup." 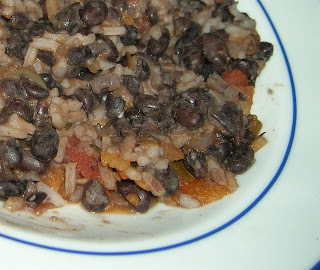 Black Beans and Rice: This was good, but it lacked the carne seca flavor. those black beans do look good ... but i have to question whether they measure up to my moms. Not even close. I wish.